Most days when I am making dinner, I listen to a podcast. Each podcast episode will have a sponsor. I have been hearing about a website called Reading Eggs for months. I was really excited when I had the opportunity to review their website and new workbooks. The new workbooks are grade specific and focus on either reading or math. 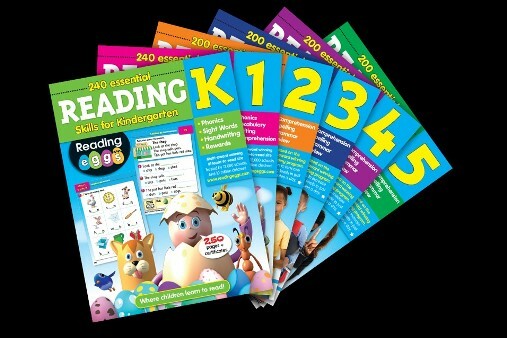 Specifically, Clarissa and I worked with the 240 Essential Reading Skills for Kindergarten workbook. Clarissa turned five while we were working on this review, so she isn’t very far in her reading skills yet. She can generally recognize the letter names (especially the capital letters), but isn’t super familiar with their sounds. The website has three levels of reading instruction: Reading Eggs Junior (ages 2-4), Reading Eggs (ages 3-9), and Reading Eggspress (ages 7-13). The first time she explored the website she thought that Reading Eggs Junior was way too easy and Reading Eggs was way too hard. It was hard to convince her to try again so we took a break from the Reading Eggs portion for about a week. During that week, we focused on the workbook lessons. The workbook lessons actually match the website really well. In the workbook, the child completes four pages of one letter. You learn the sound of the letter, decide which words start with that letter sound, finding the letter in a list, and practice writing the letter. It took Clarissa a few days to gain confidence with discriminating the letter sounds. She did enjoy writing the letters. I also really liked that each day, she was able to circle which letter she wrote the best. Clarissa actually really started to enjoy the workbook the more we did it. Now she is recognizing “at” and “am.” On the day we did “at” she was really excited because the directions said to “draw a cat.” So she wanted to sit on the couch near our cat Mittens so that she could draw her correctly. As she started to gain confidence with the workbook, we went back to the website. Each website lesson covers the same skill as the workbook. She wasn’t as frustrated with the website this time. She was able to choose the correct words that started with each letter. She also liked the videos that went with each lesson and that the little ant friend would read the words for her to help her figure out the answer. I really like the way the website is set up in that you have to complete the first lesson before you can go on to the next. This way, children are learning skills in a logical order. Also, there is a parent dashboard on the website so I can see which lessons Clarissa has completed and how well she mastered each lesson. At the end of a unit, the website emails me so I can see her progress. Another thing to note is that the website also has a math section for children ages 3-9 called Mathseeds. Clarissa loves Mathseeds! Even on days she didn’t want to do Reading Eggs, she asked to do Mathseeds. It is set up in a similar way in that the child has to complete one lesson before moving on to the next one. The dashboard and parent email works the same. She really enjoys the lessons and games. There are also workbooks available for math that you can read about from other reviewers. I think that both the workbook and the website are beneficial because it is more reinforcement of the same skills. The prices are reasonable too. Workbooks are normally $19.95, but you can use the coupon code WK10IYWAG6J for 10% off before October 15, 2018. Also, if you register before October 7, 2018, you can do a four week free trial of the website. The website membership is normally $59 for the year.